Twenty five years of memories went up in smoke when the Goundar family of Covuli Street, Simla, in Lautoka lost everything in a fire on Tuesday. The extended family of three had many cherished memories attached to their home since the sole breadwinner of the family, Muni Nadan Goundar, lost his mother five months ago. “I remember staying in this house as a child, playing and running around while my father and mother were still raising me up,” an emotional Mr Goundar said. According to his wife Reema Raju, the fire started around 4.30pm from a kerosene stove she used to fry potato chips when his mother and sister paid them a visit. “I heard an unusual sound and few minutes later it blew up and fell on the floor with the oil and kerosene spilled all over the kitchen,” she said. Ms Raju was shocked because the fire had spread so quickly. “I called my husband but by the time he saw the scene it was too late to contain it, we tried our best and just before the fridge gas blew we were all outside with only the clothes we were wearing. The Goundar family has kindly asked the public for assistance. Police spokesperson Ana Naisoro said the estimated cost of damage is $120,000 and their investigations have started. “Please be cautious with fire hazards as it takes just minutes to lose everything if we do not take the appropriate safety measures at all time,” Ms Naisoro said. 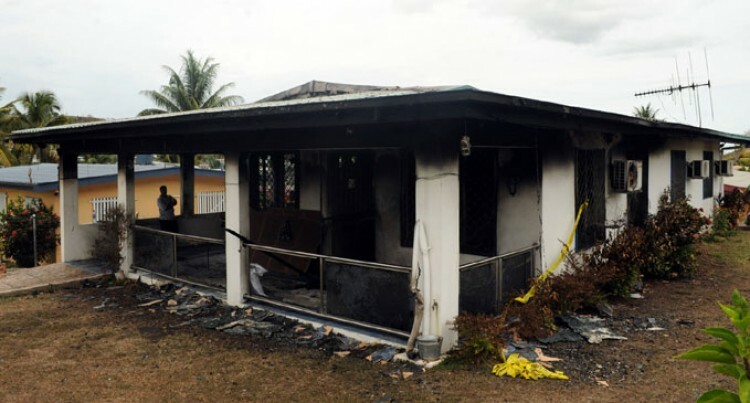 Meanwhile, on the same day another fire incident partly destroyed a three-bedroom concrete house at about 2.45pm at Flamboyant Place, Link Road Lautoka. The home belonged to businessman Dinesh Prasad. No one was at home at the time of the incident.